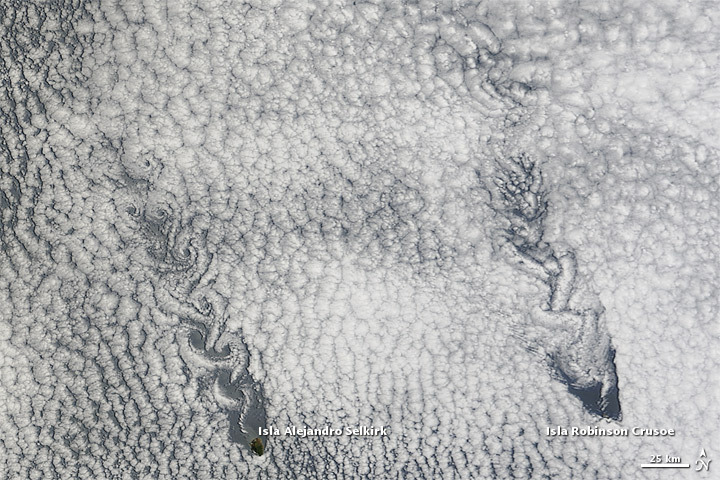 Two small islands had a big impact on the skies over the Pacific Ocean in January 2013, creating paisley patterns that stretched 280 kilometers (175 miles). 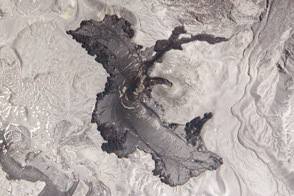 The Moderate Resolution Imaging Spectroradiometer (MODIS) on NASA’s Terra satellite captured this natural-color image on January 13, 2013. 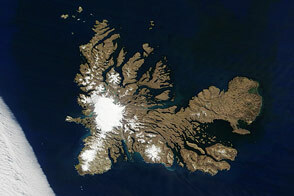 The Juan Fernandez Islands are located roughly 800 kilometers (500 miles) off the Chilean coast. The biggest of these—Isla Alejandro (Alexander) Selkirk and Isla Robinson Crusoe—are volcanic islands situated along an east-west-trending submarine ridge. Each island boasts a tall summit. With an area of 52 square kilometers (20 square miles), Isla Alejandro Selkirk reaches an altitude of 1,650 meters (5,413 feet) above sea level. Slightly smaller, Isla Robinson Crusoe has a total area of 48 square kilometers (19 square miles), and reaches an altitude of 922 meters (3,025 feet). 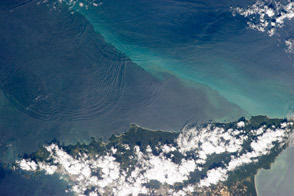 The islands are tall enough to disturb air flow over the ocean. 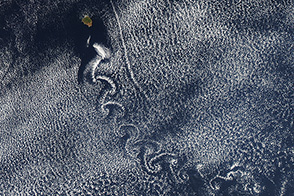 When an object such as an island interferes with the movement of air, von Karman vortices form in the air on the downwind (or leeward) side of the island. 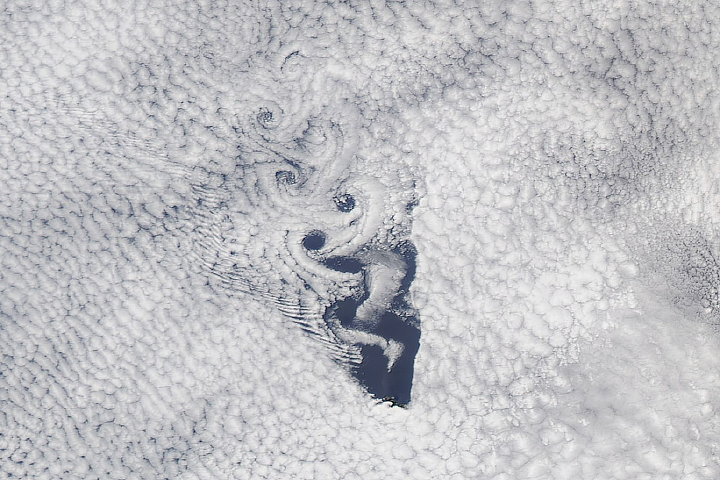 Also known as vortex streets, they are double rows of spiral eddies that are made visible by the clouds. 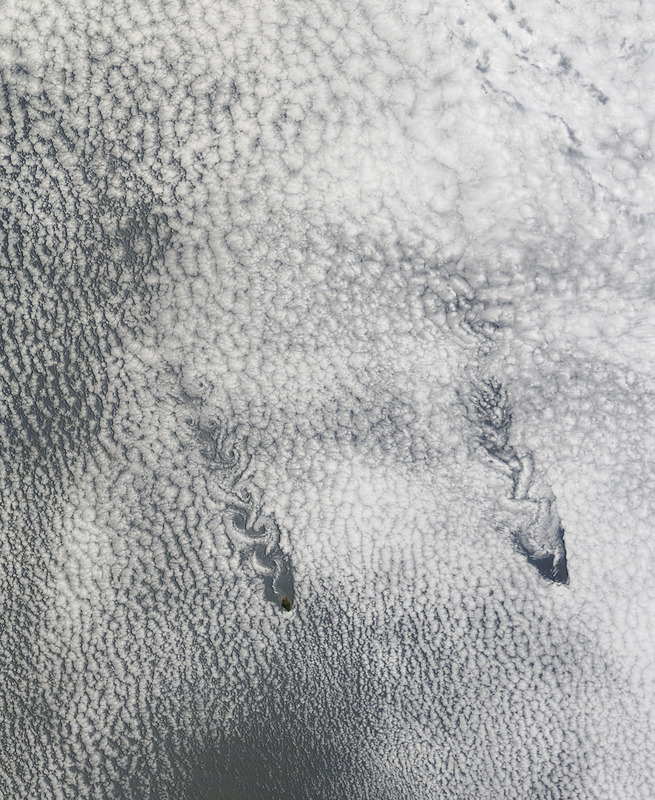 Clouds, winds, and volcanic islands collaborated on giant paisley patters over the southeastern Pacific Ocean. Baker, P.E., Gledhill, A., Harvey, P.K., Hawkesworth, C.J. (1987). Geochemical evolution of the Juan Fernandez Islands, SE Pacific. Journal of the Geological Society. 144(6), 933–944. NASA Goddard Space Flight Center. 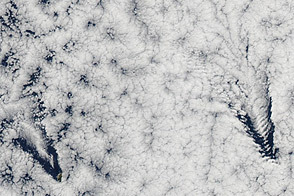 (2012, May 8) Science Focus: Von Karman Vortices. Accessed January 15, 2013.